Ah...this girl looks like she's having a great daydream, doesn't she? With the warmer weather coming, I love sneaking out on to our top deck with a cup of coffee, but so far, it's not been warm enough but a couple of times, and the children are usually requesting my attention. Oh well, so I will color this image in and enjoy the day vicariously through Mimosas Cafe;) Please check out the Paper Jewels blog if you get a chance for some inspiring creations by the other DT members. Supplies are DP - DCWV, cardstock SU Certainly Celery, Rose Romance, Bliss Blue. Flowers are made with a SU punch, and a misc sm flower punch, distressed with Rose Red ink, crinkled and accented with Kaisercraft rhinestones (which you can find at the Paper Jewels store;)). I also used clear Stickles to accent the drink and an EK Success border punch. 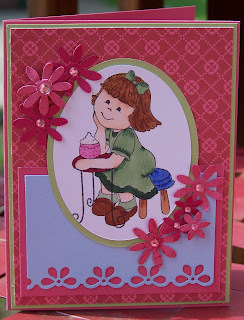 So adorable, love the green dress and flower punches. Adorable card! Love the punches you used with the image. So cute! I just love this stamp and you showed her off beautifully!! SO adorable... love that pink! What a great image, love the flowers! Wow...great card...I just love that image...wonderful coloring! Sunshine Sunday - Happy Birthday! Sunshine Sunday - Hey Chickie!